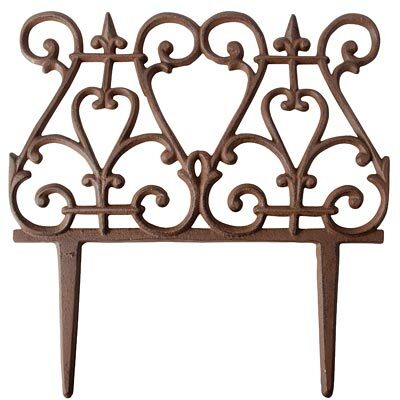 Bring an ornate look to your garden or sidewalk with the Esschert Design Scroll Garden Fence. Using a border around your walkway or garden keeps your favorite plants safe from foot traffic, and the striking design on these pieces brings wonderful style to your yard. A wealth of extended scroll shapes creates each fence section, with arches and finials at the top of each lending a classic look. Made from lasting, cast iron, this border fence will certainly remain durable for seasons of use, and the brown color with black accents enhances the traditional feel. Two 4" long legs on each section insert into soil easily, and the curved shape of the fencing meshes with your plants. Add a dynamic border to your garden or walkway with this Scroll Garden Fence. Note: This case pack includes 12 of the Esschert Design Scroll Garden Fence Sections.